Explore the sweeping saga of God's people and their sacred journey. 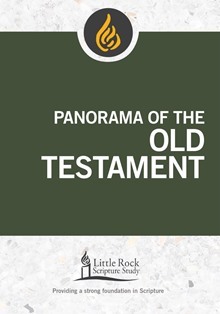 Panorama of the Old Testament surveys the variety of books found in the Old Testament. Uncover interwoven themes, the background of familiar characters and God's overall plan of salvation. A perfect way to begin a great adventure or step back and see where you have been in your study of the Bible. Commentary, study and reflection questions, prayer and access to recorded lectures are included. 4 sessions. Stephen J. Binz is a biblical scholar, award-winning author, and popular speaker. He studied Scripture at the Pontifical Biblical Institute in Rome and Jerusalem, and has developed dozens of books and programs in biblical theology and spirituality, including Advent of the Savior: A Commentary of the Infancy Narratives of Jesus; Introduction to the Bible: A Catholic Guide to Studying Scripture; The Passion and Resurrection Narratives of Jesus; The God of Freedom and Life: A Commentary on the Book of Exodus; Panorama of the Bible: New Testament; and Panorama of the Bible: Old Testament (Liturgical Press). He offers keynotes and workshops at church conferences and leads pilgrimages to the lands of the Bible. Information about his work may be found at Bridge-B.com. Little Rock Scripture Study is a ministry of the Diocese of Little Rock in partnership with Liturgical Press and has produced widely used and effective Bible study materials for adults for over forty years.